Sometimes special bonds form between unlikely friends. Such is the case with Bogie and Maytag. Bogie is a spunky black and white puppy found wandering the streets of Detroit. Maytag is a sweet, subdued adult left chained to a refrigerator on the city’s east side. You may expect Maytag to be standoffish after his difficult start in life, but somehow, Bogie managed to wag his way into the older pup’s heart! 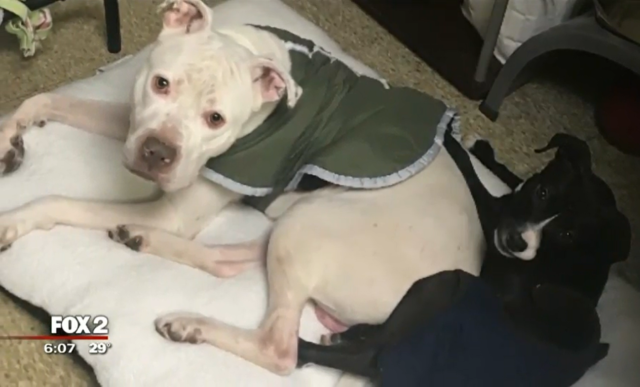 The pair became fast friends after arriving at Detroit Dog Rescue. “I started to go in and I would see they were in the same cage, then they were in the same office, and then they were dressing up together,” Kristina Rinaldi with DDR told Fox News. The staff and volunteers are so touched by the dogs’ special bond, they hope to help them find a foster home where they can spend the holiday season together. “This bond is so unique and it’s so heartwarming to see. Some of these dogs are in such dire situations, and sad, sad situations and to see a puppy help an older dog and an older dog help a puppy, it’s so sweet,” Rinaldi said. It can be difficult to find homes for single dogs, let alone bonded pairs, but DDR is confident the right family is out there. They are counting on the magic of the season to help Bogie and Maytag receive the gift of a happy home. “You know they’ve lived in this stressful shelter environment. They need a place that’s probably no other dogs right now, no children. If you have a little laundry room that’s what they’re used to. They need a quiet place, somewhere with a lot of holiday cookies and treats, and where they’re going to get some attention and some love,” Rinaldi said. Anyone interested in taking these adorable buddies – or one of the many other dogs hoping to find foster/permanent homes – can visit detroitdogrescue.org.